​​The American Academy of Pediatrics (AAP) encourages parents to help their children develop healthy media use habits early on. For children younger than 18 months, use of screen media other than video-chatting should be discouraged. Parents of children 18 to 24 months of age who want to introduce digital media should choose high-quality programming/apps and use them together with children, because this is how toddlers learn best. Letting children use media by themselves should be avoided. For children older than 2 years, media limits are very appropriate. Limit screen use to no more than 1 hour or less per day of high-quality programming. Co-view or co-play with your children, and find other activities for to do together that are healthy for the body and mind (e.g., reading, teaching, talking, and playing together). All children and teens need adequate sleep (8-12 hours, depending on age), physical activity (1 hour), and time away from media. Designate media-free times together (e.g., family dinner) and media-free zones (e.g., bedrooms). Children should not sleep with devices in their bedrooms, including TVs, computers, and smartphones. Parents are encouraged to develop personalized media use plans for their children. Media plans should take into account each child's age, health, personality, and developmental stage. 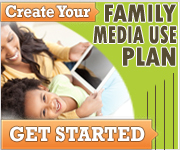 Create your Family Media Use Plan here and remember to communicate your plan to other caregivers, such as babysitters or grandparents, so that media rules are followed consistently.